As 2015 draws to a close, we want to send a heartfelt “thank you” to all of our wonderful customers, partners, and team members. We appreciate you, and wish you the best of everything in the coming year and beyond. Is there a person or two on your gift-giving list that appears to have everything, and you don’t know where to begin shopping for them? Are you looking for a creative, thoughtful gift for someone you are trying to impress? Are you having trouble finding items that will express your love and appreciation to your mother or your spouse? Are you struggling to locate a gift that is will be both useful and give delight to someone who prefers practical things? Then you are not alone. Very often, locating the right gift for that special person is a very difficult task. Well, have you considered giving the gift of time? Whether their homes are big or small, or even if they live in an apartment, there are two things that everyone on your holiday list could use: time and a clean home. With most people spending over 600 hours a year cleaning, a gift of our professional maid service will save your recipient an incredible amount of time and effort. Your gift will be both thoughtful, and valuable, and will be sure to impress your recipient. It’s wonderful to have everything so clean it sparkles. We have had Sponge & Sparkle for a few years now and I am a fussy homeowner. They do a fantastic job–coming home after a hard week, it is so wonderful to have everything so clean it sparkles. Baseboards, blinds, all the surfaces are spotless. And they come on time every time. Great cleaning service. 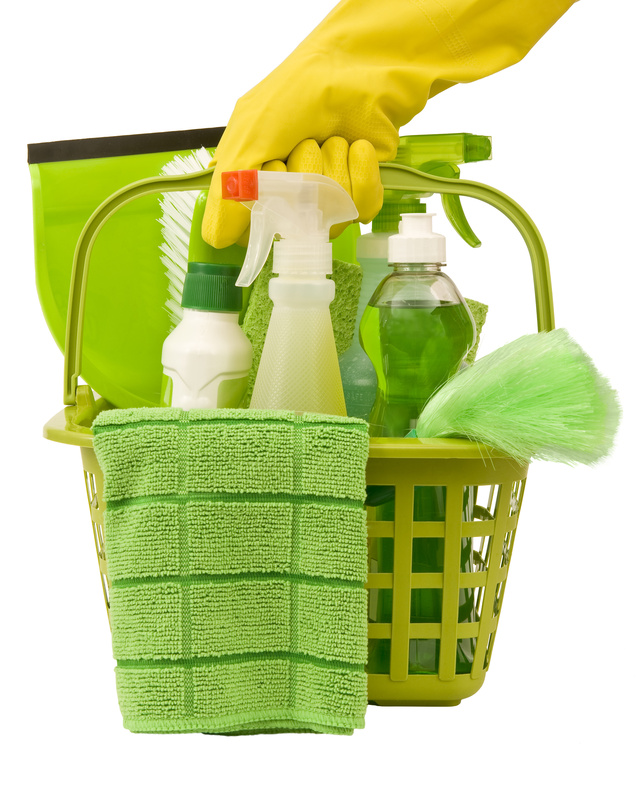 Read more Atlanta house cleaning reviews here. By giving the gift of a cleaning service for your friend, family member, or loved one, you are telling them that you value them, you value their time, and that they deserve a little pampering. They can reclaim their time catching up on other chores, dabbling in a hobby, or just relaxing with friends like you. We have added a very special touch of lovingly packaging our gift certificates in an attractive teacup set. This will provide the hint that so your special gift recipient should relax and enjoy a sip tea while we clean for them. We also provide free local delivery, or you can pick up the gift certificates from us. Call us at (404) 633-9652 to find out about our holiday gift packages. Our Fall 2015 Newsletter is here! The winner of our contest (and how you can win free cleanings)! To read a copy of the Fall 2015 newsletter, click here. These days we hear a lot about “green” products and services. Since use of the term is not regulated, how do you know if the product or service is really beneficial to the environment? Our bathroom and kitchen cleaner is made by Seaside Natural and contains natural ingredients including lavender, eucalyptus, tea tree oil, borax, vinegar, and alcohol. These products not only clean and sanitize effectively, but are also environmentally benign. Our products are non-toxic and biodegradable. Many cleaners contain harsh chemicals that can actually burn and injure people if not handled properly. Many conventional cleaners also persist in the environment (that is, they do not biodegrade). Wastewater containing these chemicals contributes to water pollution. Our products contain low or no volatile organic compound (VOCs)—chemicals that are released into the air when a product comes out of the bottle. VOCs are lung and eye irritants and aggravate allergies. Our products improve rather than degrade your indoor air quality. Our products are formulated as concentrates and/or come in bulk, which reduces waste from excess packaging. We are convinced that clean also means green! We make your home sparkle while respecting and protecting the health and beauty of your household and Mother Earth’s too. I have been using this cleaning service for at least 22 years. their employees don’t come and go but stay with the company, which gives me a great degree of comfort. If anything is not just right, the owner herself will either come out or send someone to redo it. I feel like they are part of our family! Also they are using “green” products more than ever. I have had Sponge & Sparkle once to do the head to toe hourly cleaning, and now I had them a second time for a regular monthly cleaning that I plan to continue indefinitely! The service is the best I’ve ever experienced, and the rate is worth every penny. 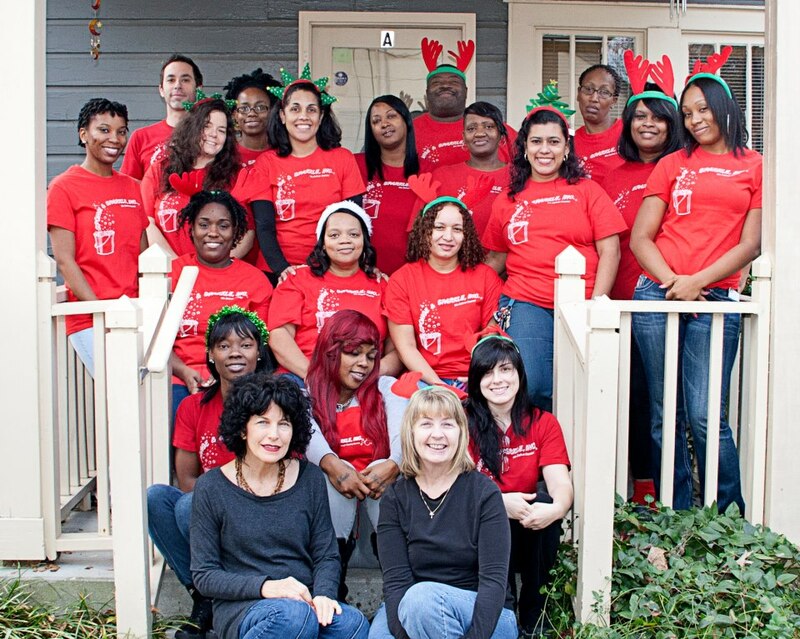 The staff are so courteous and cheerful, and the work they do is truly stellar. I have been using this agency for 3 plus years and have been delighted not just with their good work and professionalism but how personable their employees are at all times. They are able to accommodate emergencies including cancellations which I am sure puts them at a hardship but do so with a smile and with compassion. Please try them and use their detailed cleaning services at least once and you will be in for a treat. More importantly they use environmentally friendly products that is a huge plus for me. Happy Labor Day from Sponge & Sparkle! 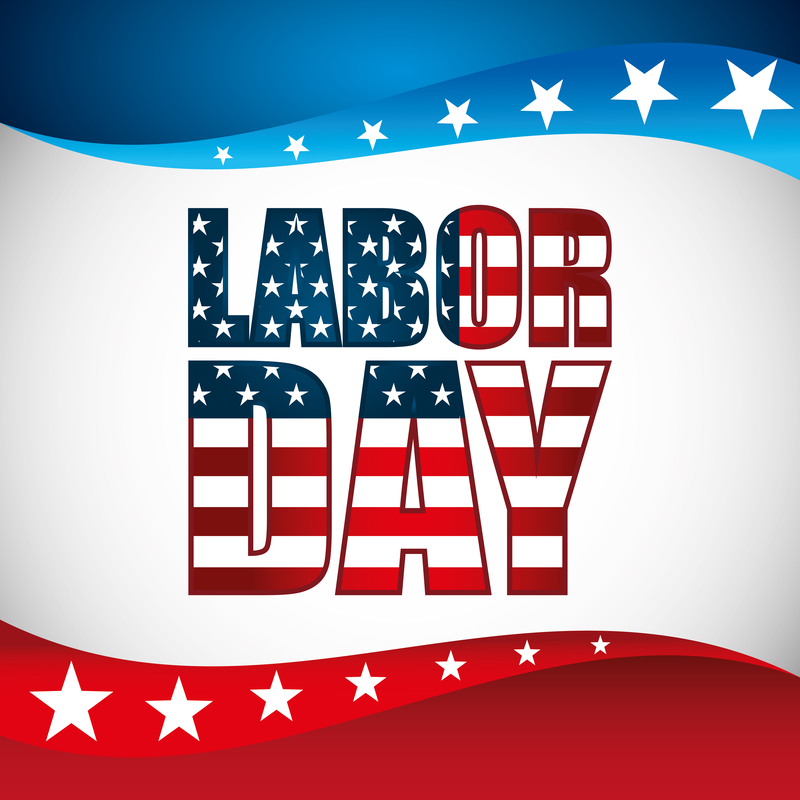 From our family to yours … have a safe and Happy Labor Day. There are literally thousands of home cleaning services out there. What criteria should you use to select one? After all, you will be allowing a stranger into your private space, most likely when you’re not there. Trust is important. A friend or relative might recommend a cleaning service, but you’d be wise only to consider those that belong to The Association of Residential Cleaning Professionals (ARCSI), a trade organization dedicated to upholding the highest standards in the housecleaning industry. ARCSI awards a Residential Cleaning Seal of Excellence to members what meet a rigorous set of standards. They must prove that they carry both liability and workman’s compensation insurance; comply with federal, state, and local labor and tax laws; and that they perform background checks on prospective employees as part of their hiring process. 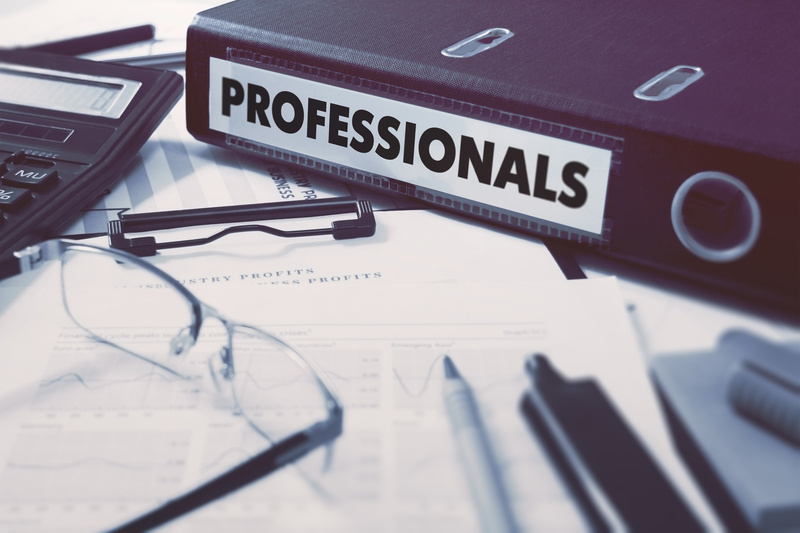 ARCSI-certified companies must also document that they participate in on-going industry and business educational training and provide employees with professional equipment and supplies. 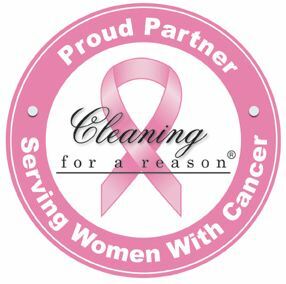 ARCSI member companies are also involved in their local communities, such as offering free house cleanings for women undergoing cancer treatments; for elderly and disabled veterans; and sponsoring local youth activities and cultural events. You can feel confident that a company that has been award the ARCSI Residential Seal of Excellence will provide professional, ethical, and efficient cleaning services. After all, you want your home to be thoroughly cleaned, not cleaned out. My family has used sponge and sparkle for years. They are reliable, flexible and professional. They are excellent as both a regular, recurring cleaning service and willing to do custom cleanings as well. I have been a client of Sponge & Sparkle for almost 15 years. They do an outstanding job, have wonderful customer service and a very friendly and professional crew. They also are extremely trustworthy (they’ve had the key to my home since the beginning). I can highly recommend the company! Our Summer 2015 newsletter is hot off the presses! The winner of our contest (and how you can win your own gift card)! 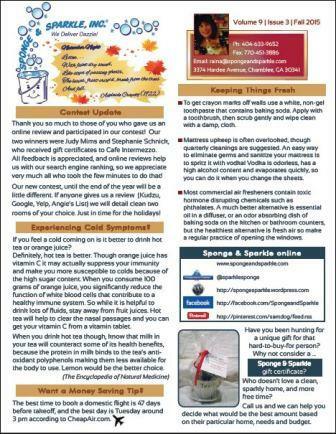 To read a copy of the Summer newsletter, click here. The decision to hire a professional house cleaning service can be daunting – after all, you are letting someone you don’t know into your home. 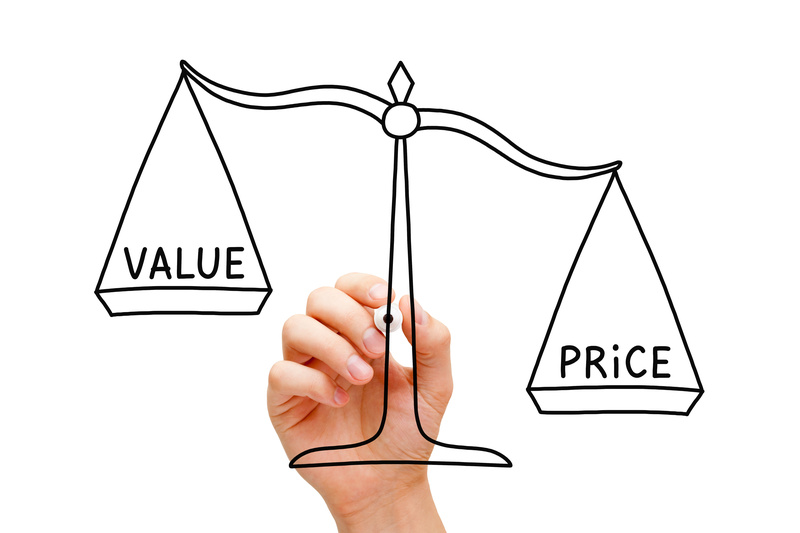 Hiring the wrong service, such as a low-cost provider, could prove to be an expensive mistake. Even though I make the effort to personally stay in touch with all of our customers, I know that our employees (Sparklers) have the most contact. That is why Sponge & Sparkle carefully hires, screens and trains all employees. We also strive to treat our Sparklers using the Golden Rule. Although the maid and house cleaning industry has a high turnover rate, our employees stay with Sponge & Sparkle more than 10 times longer than the industry average. We are grateful for the loyalty and incredible work ethic of all of our employees. Here are some of our clients’ gracious comments about our Sparklers. Sponge and Sparkle has exceeded our expectations with the cleaning service they provide. Sheila’s detailed work and pleasant demeanor are greatly appreciated. We are happy to have found a company to trust with the care of our home. We’re really happy we went with Sponge and Sparkle. The cleaners Mabia and Jared are fast but very thorough, and are always on time. We have a converted loft that gets dingy and dusty very easily, and it always looks and feels brand new after they’ve cleaned. Highly recommended. Sponge and Sparkle was recommended to me by my Sister in law. She loves them and I see why! I have a home that I am trying to sell. I needed above and beyond the average type of cleaning. Sponge and Sparkle came through beautifully. They cleaned everything everywhere! I have 3 kids, 2 large dogs, and a long-haired cat. It was not an easy job! For me it was the best cleaning job I have ever had and I have used housekeepers for 15 years! I am going to continue to use them as my house remains on the market. They’re an asset now I would never let them go! I would recommend them to anyone! Sponge & Sparkle is the best cleaning service in Atlanta. I’ve tried others and none are as professional or clean. Karen cleaned our home for the first time last week and she did an incredible job! The cleaning was very thorough, she took her time and made my home “sparkle”! She was a delight to have in the house and she was very accommodating to my “work from home” needs. I look forward to having her back. A+!